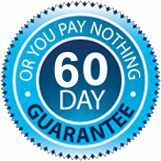 We are confident in the services we provide, that’s why we offer a 60 Day, Risk Free Guarantee. Real Property Management guarantees an approved tenant applicant within 60 days of the property being rent-ready – or you pay nothing! Call for more details. Also talk to us about protecting yourself from eviction costs as well!